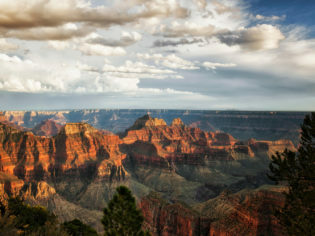 For many, Grand Canyon National Park is a sightseeing coach stop, a natural tonic for the lights of nearby Las Vegas and a ‘been there’ photo opportunity. But the world’s most famous canyon in Arizona, which is celebrating its 100th anniversary as a national park, deserves better. As you’ll see here, it’s been home to people for thousands of years, and it took millions of years for the Colorado River to expose billions of years of geological history as it scoured a path down into the bedrock. The Grand Canyon is split into two distinct zones, the North Rim and the South Rim. It’s about a four-and-a-half-hour drive to get from one rim to the other, so ensure you plan your trip accordingly. If you’re keen to visit the North Rim, your best bet is to fly to Las Vegas, then drive the four and a half hours to the park. If you’re heading to the South Rim, from Phoenix it’s a three-and-a-half-hour drive. For those without a car, the Arizona Shittle runs vans from Flagstaff to to the village three times a day. The best times to visit the Grand Canyon are March through May and September through November, when the crowds have shooed and daytime temperatures are predominantly cool. If you decide to visit during the summer (the park’s peak season), be prepared for hordes of tourists and very limited lodging availability. When travelling through Grand Canyon National Park, it’s best to over prepare with your packing. We suggest sunscreen, a water bottle, optimum snacks, a camera, a small first-aid kit and a backpack to carry it all in. Fit these natural and woman-made wonders into your Grand Canyon itinerary. You’ll need to reserve a permit to hike to this natural spectacle in the Havasupai Indian Reservation. A 30-metre waterfall cascades into a brilliant aqua-blue plunge pool that owes its colour to the high levels of calcium carbonate in the water, forming a stark contrast with the steep ochre cliffs of the creek. The 16-kilometre trail to the campground takes four to seven hours to hike, passing through the village of Supai. See the Colorado River at its dramatic best from this vantage point on the rim of the Grand Canyon. A view of the river carving a tight meander through the red rock, it’s perhaps the best spot to see how the power of water has hewn the steep sides of the Grand Canyon over millions of years. Just outside the northern confines of the park, take a short walk from the highway to reach Horseshoe Bend and get snapping. You wouldn’t think that architecture should be on your Grand Canyon agenda, but you’ll find the works of architect Mary Colter, who designed gift shops and other tourism structures sympathetic to the landscape here in the first half of the 20th century. One of the few female architects of her day, she was the pioneer of a rustic style that incorporated Native American touches and traditional pueblo design. Make sure you head to Colter’s Hopi House and Desert View Watchtower. Having marvelled at 20th-century faux Pueblo Indian architecture you can see the fascinating remains of the real thing at the 800-year-old Tusayan Ruins, a snapshot into the lives of people here before European settlement. The low stone semi-circular walls of the main living area, storage rooms and a kiva, a ceremonial space, can be explored with a guide or by yourself on a short trail. The Tusayan Museum here is a reconstruction of a Hopi Indian house. One of the most spectacular places on the planet to go rafting, the Colorado River surges and at times sedately pours past gargantuan cliffs. Take a multi-day trip with experts in the field like advantage. The South Kaibab Trail gives you a taste of the gradients that make this place so special, rewarding you with the best views for your efforts. It winds down the canyon to a campsite on the Colorado River, taking about four to five hours each way. Rent a convertible for this one, a scenic drive that affords sweeping vistas of the Grand Canyon dotted with pull-over viewpoints along the way. Plus it takes in the Tusayan Ruins and Museum, and Mary Colter’s Desert View Watchtower. You’ll be fortunate to spot the biggest predator in the park, aka the cougar; don’t worry, they’re not interested in humans. The Aphonopelma behlei, a species of the world’s biggest spiders, lives here. Watch you don’t step on the four-inch beasts. Like miniature Godzillas, these lizards have orange and black blotchy scales and lounge around in the surrounding deserts. Look out for this striking black and yellow amphibian in pools and creeks around the Grand Canyon’s rim.